A top Federal Reserve official is worried about a warning sign in the bond market. The yield curve, a measure of short-term and long-term US Treasury bond rates, is flattening as investors prepare for the Fed to raise interest rates to keep the economy from overheating. Some economists fear the curve could tip over and invert if the Fed slams the brakes too quickly. 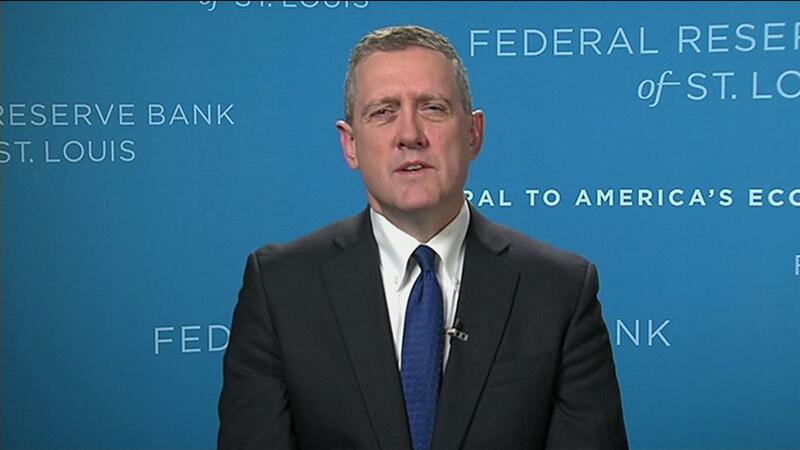 "I am getting concerned about the flattening yield curve," St. Louis Fed President James Bullard told CNN's Richard Quest on Wednesday. "The inverted yield curve is a powerful predictor of economic downturns." The curve inverted before the Great Recession a decade ago and before a shorter recession in 2001. But Fed Governor Randal Quarles said Wednesday that an inverted yield curve would not signal the United States is entering a recession anytime soon. "I don't think it's likely the inversion of the yield curve is a reflection of a recession to come," Quarles said at the annual Bretton Woods conference in Washington. Two-year bond yields, sensitive to the Fed's actions, are rising as investors' expectations for rate hikes go up. Ten-year yields have halted their march toward 3% as inflation fears ease. "I think fundamentally the market just doesn't see that much inflation pressure," Bullard said. The gap between the two-year and the 10-year has tightened to its narrowest since 2008. Bullard warned that if the Fed raises interest rates too aggressively, it could push the curve into an inversion. The Fed plans three rate hikes in 2018, barring a surprising pickup in inflation. "I think we've put ourselves in a good position here," Bullard said. "I would just not go any further unless there are further surprises." — CNNMoney's Matt Egan and Donna Borak contributed to this story.